Long Binh ammo dump during early morning of January 31, 1968. 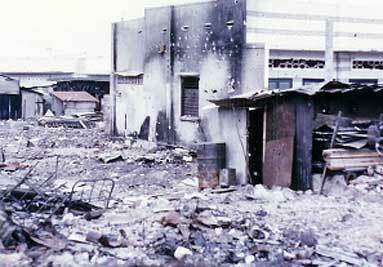 While a silent Bien Hoa Air Base slept, the enemy forces unleashed their attack. Beginning at 03:00, they launched their surprisingly well-coordinated assaults at major installations throughout the countryside. The assaults came within minutes of each other. 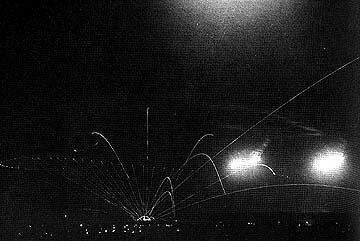 The Bien Hoa Air Base received approximately 150 rounds of enemy rocket and mortar fire. Almost simultaneously, the VC ground forces made their move to overrun the base. Formed into four companies of 52 men each, the soldiers penetrated the perimeter between bunkers in the 101st Airborne Div. cantonment area and the III Corps HQ, gradually making their way to the approach end of runway 27. It was there they were met by the gun ships of the 145th CAB! during early morning hours of January 31, 1968. (Map copied from "145th CAB, Pictorial History Vol. II"
produced by the PIO of 145th CAB, APO 96227. Printed in Tokyo by DaiNippon Printing Co. Ltd.(out of print). 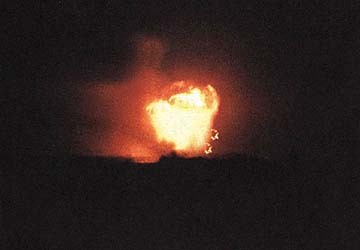 All night long, personnel had received sporadic small arms fire from the water tower near the entrance to the air base. The 12th CAG Commander and the 68th AHC "Top Tiger" elements became airborne and returned fire at the water tower, while men on the ground observed the battle only 100 meters away. By noon the tower was under control and three enemy guerrillas were dead, but they were hard to beat in their well-fortified positions. After a eventful night on alert at the Birdcage, I was awakened (trying to sleep in bunker) at first light to the sound of a M-60 chattering away. The weapon was aimed at the newly built and painted (orange-white checkered) water tower by the main gate. I asked one of the men "What are you firing at? " and the gunner replied "VC on the water tower". After telling them to stop shooting unless they could see someone, I went to our Operations shack to check-in and see what was going on, and found myself the only officer around. About the time I arrived, a jeep pulled up with a Army MP Major May who asked me if we could get up to the top of the water tower. He said that there were VC snipers and had shot two of his MPs at the front gate. He said they couldn't get up from the ground, as there was an unfinished small opening in the bottom, and the VC opened up whenever they approached. He asked "Could we get some CS gas up there?" I sent an NCO to get some CS, and called the CO (MAJ. Bill Bradner) on the radio, as he was on short final, and asked him to keep his ship running, we needed a lift to the water tower. I had 4 fragmentation grenades on my flak jacket and traded them for 6 CS, and gave 6 to the Major. I had an AR-15 and six clips loaded with straight tracer, two .38's, and Major May (in Khakis) had an M-14 with one clip. The MAJ Bradner picked us up and headed for the water tower. 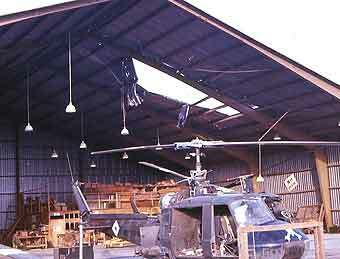 I told the Crew Chief to keep his M-60 trained on the tower as there were VC snipers up there. As we approached, I could see no VC, but spotted a metal hatch covering approximately a 3' x 5' opening on the top and gate side of the tower. I realized dropping gas on top wouldn't work. As we approached, I asked the CO to get us closer, and he hovered about 6' over the tower. I got out on the skid and jumped onto the tower, looked up and motioned for the Major to follow. He was shaking his head in the negative, so the Crew Chief "helped" him out with a gentle shove. Guess he didn't want to leave me there alone. The Major and I took cover behind a slight bubble in the tower's center, an 18" rise. Then MAJ Brander left and it got real quiet. The Major said, "Crawl over there and put some gas down inside." He had the rank (I went over a WO1 and had received a direct to 2nd Lt in November 67'). Soooo, I said" Cover me", laid my AR down, and low crawled over to the hatch cover. As I came along side, I found a small number of brass casings, so knew there had to be someone inside. I rolled on my back, took a CS grenade, held the handle down and pulled the pin. With my left hand, I eased up the lid far enough to slip the grenade inside. Pulled the pin on a second grenade, and repeated the motion, hearing the handle "pop" on the first one as I let go of the second. I then scurried back to the Major and "shelter". I began to smell the CS gas, and my eyes started to smart. No gas mask! As I looked around the surface of the tower, I could see small fissures and small chunks of concrete missing , evidence of the Bandits and other guns attacking the tower. The Major said " Go put some more gas in there" I replied, "It's your turn." So, he crawled over, and flipped in two of his grenades. Still no sound was heard from inside. Getting bolder, I moved over and put in my remaining four grenades, two of the Major's, and retreated to our shelter. Now, with all that gas in there, it was coming up through he cracks in volume! The Major suggested I go put some rounds down inside. I approached the hatch, my AR on full auto, flipped the hatch completely off the 4" lip it covered, and "opened up." However, only one round fired. I quickly re-cycled the weapon and tried again: Only one round fired again. I moved back to the shelter and told the Major that there was a steel ladder going down into the tower at a 45 degree angle, and suggested he try to fire inside while I covered him with my .38. He moved over, stood up and "click"--- the M-14 didn't fire. I think the sear must have broken when the weapon fell to the tower when we "landed". Sooo, had we been greeted by VC when we first arrived, we would have had one shot, thinking we had one full auto and a semi-auto! I set the selector at single shot and moved over to the opening and proceeded to empty my AR, as fast as I could pull the trigger. Interesting to see tracers zipping around in the dark in a round enclosure! I emptied the first clip, and pulled a second from my left jacket pocket, reloaded and emptied it. 60 rounds inside. No sound from inside. Pulled the second clip from my left jacket pocket, reloaded and emptied that clip. 90 rounds were fired and still, no sound from inside. I'd been using my right hand to pull the clips and load the weapon, while cradling it in my left arm. Now with having to change hands to get at the clips in my right flack jacket pocket, it was awkward, and so for the first time, shifting the weapon to my right arm, I stepped back from the edge of the opening. As I did, an automatic weapon opened up from inside, knocking concrete from the lip of the opening. Had I remained where I was while changing clips, probably wouldn't be writing this now. Now I'm mad! I reloaded, moved to the narrow side between the hatch and the edge of the tower, and proceeded to pump two more clips down inside, expending all my AR ammo. Pulled one .38 and fired all five rounds. Decided to keep my other .38 "just in case". Now there was only silence, and a lot of gas! After about 30 minutes, we tried to get the attention of someone to come and get us off, but no luck. After a short while, we decided to climb down a small, thin, shaky, built for 110 lb Vietnamese, bamboo and vine ladder left from the construction. I had no sling on my AR, so slid it up under my flack jacket. Ouch! The barrel was still hot! As I started down the ladder, I was probably as scared as any time during my tour! I don't mind flying, but am not fond of tall ladders and high places, and this was about three stories off the ground! I'd just gotten down about three rungs, repeating the Lord's prayer quite fervently, when the Major started down. I yelled "NO! Not two on this ladder! Wait!" No dice, here he came! The ladder held and we managed to get down. The Major's MP's on the ground had a jeep and two six packs of cold orange soda waiting for us. We both finished off at least four of the sodas. CS will really dry you out! 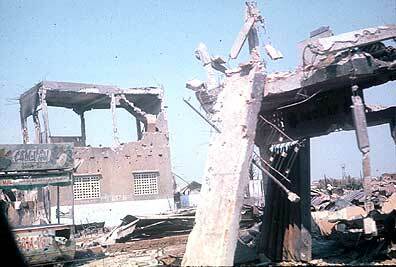 III Corps HQ, adjacent to the Air Base came under mortar attack at 0545. By 0700, "Charlie" had begun to move from his vulnerable position of the end of the runway to the buildings across the street from the HQ. The occupants of the III Corps HQ compound received automatic weapons and RPG rocket fire from the new enemy emplacements gun ships and armored vehicles from the 11th ACR engaged the enemy forces in house to house fighting and drove them from their positions. The Viet Cong casualties were extremely heavy during this encounter. positions outside Bien Hoa City. 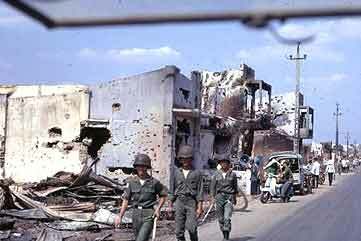 The Viet Cong also launched a major effort in the Saigon-Cholon area. The "Bandits" of the 118th AHC launched combat assaults against the VC firmly emplaced in the Phu Tho Race track. 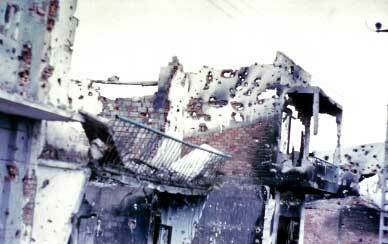 Elements of the 68th AHC were in heavy contact with enemy forces occupying the Cholon District of Saigon. Cobra aircraft from the 334th Armed Helicopter Company land Cobra NETT were also dispatched to Saigon to add their firepower. Helicopters of the 190th AHC were called upon to evacuate the besieged defenders of the American Embassy. Since the American New Year, there had been strong indications that the enemy was planning a major offensive. 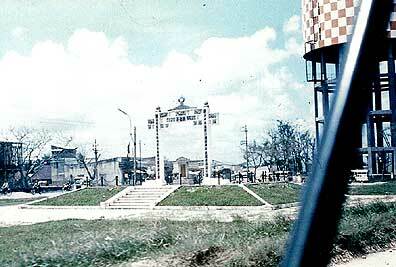 In one month the 274th and 275th VC Rgmts had moved from Bu Dop, to the north, to the Bien Hoa area. And during the same month, the 68th Rgmt of the 9th VC Div. had moved from near Tay Ninh to the Bien Hoa area. 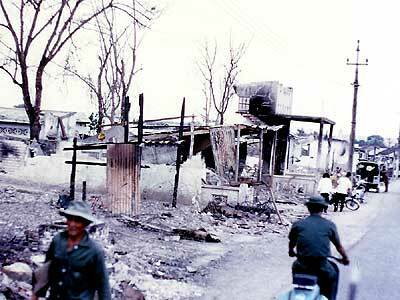 The VC had even warned the residents of Bien Hoa City to stop cooperating with the U.S. Forces or face annihilation. Amazingly, at 1900 on 30 January, seven VC had ridden by the main gate of Honour-Smith Compound and shouting , "Yankee--tonight you die." The attack and "Charlies" presence was keenly felt by all U.S. personnel of the 145th CAB. 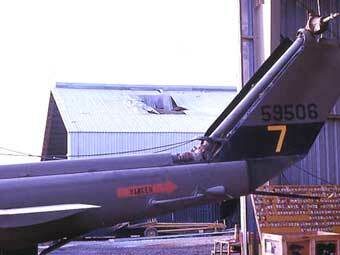 Maintenance personnel worked virtually around the clock in order to put damaged aircraft back in flying condition. Ground crews refueled and rearmed helicopters in minimal time. Company clerks and cooks learned how to be door gunners and basic infantry training was put to use. For the first time in many months, there was no mail--it was backlogged in Ton Son Nhut or stacked up in San Francisco. Everybody became accustomed to "C" rations, and hot meals in the mess halls were few. "I was the 1SGT of the 118th during the Tet of 1968, also called the Defense of Bien Hoa. 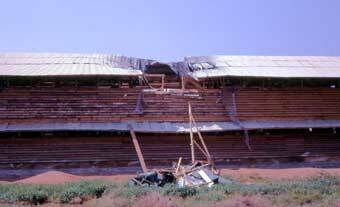 As I remember this night, around 12 or 12:30 a.m. the sirens went off and all hell broke lose. We were in a cloud of disarray and completely out of sync. As you know there were no officers on the Bailey Compound, only in the 145th CAB HQ which could only be entered from off the Bien Hoa Air base and thru the gate from Bien Hoa City." "We mustered everyone we could into the bunkers. I went through the quarters making sure everyone was out of the bldgs. and no one was injured. I remember one trooper was injured by a piece of shrapnel that had come down the barracks hall just as he stepped out of his room going to the bunker. He said the first thing he could remember was the introduction into country when he first came to the 118th. He remembered the 1SGT told him the first thing he was to get into was his helmet and flack jacket! Well, the piece of shrapnel happened to hit him just over the forehead. The helmet had stopped it and only slightly pierced the skin a little." "Then we were all in the bunker with no lights waiting for the attack to lift so we could get all personnel to the flight line. After all had left for the flight line and I was checking the bunker for anyone, I heard a noise! I sounded off, "who is there"? No answer. I said again, "Who is there"? and still no answer. I then jacked a round into my M-16 and who would you believe opened his mouth but, SGT Cuffee, the supply SGT. I almost did him in. I had no way of knowing who it was with no light in the bunker." "I then went to the CP and tried to contact the Commanding Officer(MAJ Guidroz). There was much more that happened that night. Seems like the fighting went on for days and days." 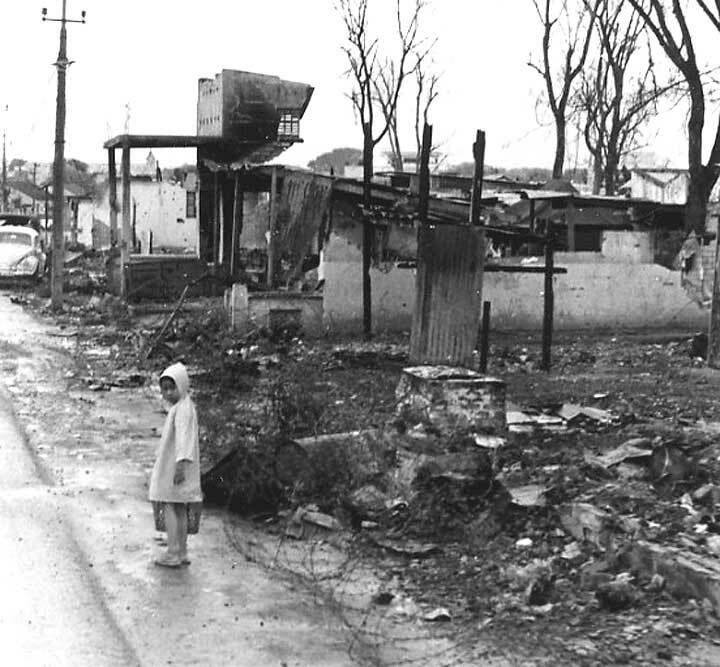 town of Bien Hoa during Tet 68. Tet-68 damage on road between Long Binh and Bien Hoa. 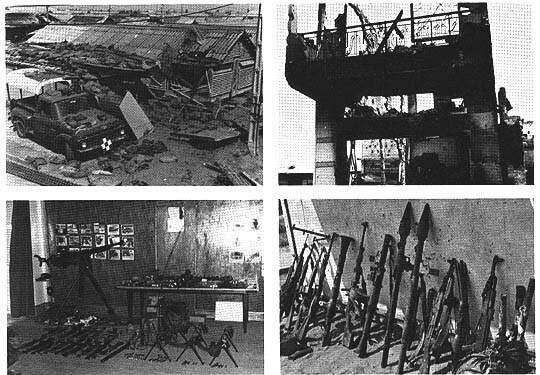 Typical damage on Bien Hoa Air Base and within Bien Hoa City above. Captured weapons below. 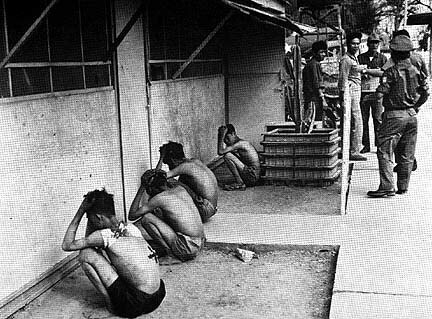 Captured VC suspects on Bien Hoa Air Base.